To bring up the Format (Table Element) Dialog Box, right-click on the element in the table that you wish to modify and choose Format (<element name>) where <element name> is the type of table element that you clicked on (title, stub, column head, etc.). Hide: When checked the selected element will not be displayed in the table. If a column head or row stub is selected, then the associated column or row will also be hidden. Note that stub heads, titles and data cells may not be hidden. Custom Text: When checked, the default text generated by CSPro for the selected element will not be displayed. You may add your own text for the selected element by double clicking on the element and typing in the new text. Note that if you double click on a table element and add your own text without first checking the custom text box, CSPro will automatically check it for you. You can uncheck this box to replace your new text with the default CSPro generated text. Font: Displays the current font and font size for the selected element. You may switch to a different font and/or font size by clicking on the change button. Text Color: Displays the current color used to draw the text of the selected element. To change the text color, click on the square displaying the current color. Fill Color: Displays the current color used to draw the cell background of the selected element. To change the fill color, click on the square displaying the current color. Indent: Allows you to set the indentation of the selected element from the right and left edges of the cell. To set the indentation for the selected element, first uncheck "use default indentation" and then modify the numbers for "Left" and "Right" indentation appropriately. Note that columns in the table will automatically be made wider to accommodate indentation. Alignment: Allows you to set the horizontal and vertical justification of the selected element within its cell. Using the horizontal alignment control, elements can be right justified, left justified or centered. Using the vertical alignment control, elements can be top justified, bottom justified or centered (middle). Lines: Allows you to set the borders on the top, left, bottom and right sides of the selected element. Each side of the element may have no border, a thick border or a thin border. 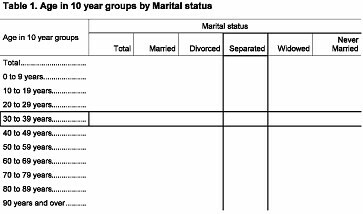 Note that lines may not be modified for an individual data cell. Instead you should set the lines for a whole row or column by setting the lines for the associated stub or column head and checking the "extend lines into cells" checkbox (see below). Extend Font into Cells: When this is checked for a column head or stub, the font and font size for the selected element are applied to all cells in the associated column or row. For a stub, all cells in the row of the stub will share the font of the stub. For a column head, all cells in the column underneath the head will share the font of the column head. Extend Lines into Cells: When this is checked for a column head, spanner, stub or caption, the lines (borders) for the selected element are applied to all cells in the associated column(s) or row. For a stub or caption, all cells in the row of the stub or caption will share the top and bottom line settings of the caption. For a column head, all cells in the column will share the left and right line settings of the column head. For a spanner, the cells in the rightmost column underneath the spanner will share the right line setting of the spanner and the cells in the leftmost column underneath the spanner will share the left line setting of the spanner. Extend Text Color into Cells: When this is checked for a column head or stub, the text color for the selected element is applied to all cells in the associated column or row. For a stub, all cells in the row of the stub will share the text color of the stub. For a column head, all cells in the column underneath the head will share the text color of the column head. 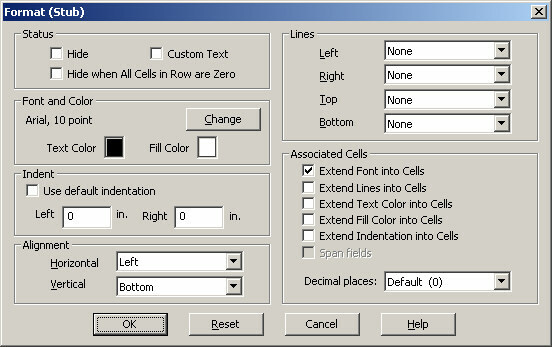 Extend Fill Color into Cells: When this is checked for a column head or stub, the background color for the selected element is applied to all cells in the associated column or row. For a stub, all cells in the row of the stub will share the fill color of the stub. For a column head, all cells in the column underneath the head will share the fill color of the column head. Extend Indentation into Cells: When this is checked for a column head or stub, the indentation setting of the selected element is applied to all cells in the associated column or row. For a stub, all cells in the row of the stub will share the indentation of the stub. For a column head, all cells in the column underneath the head will share the indentation of the column head. Span Cells: This setting applies only to captions. When this is checked for a caption, the caption spans the entire row. By default captions are placed in the first column of the table along with the stubs and the cells containing them are the same size as the cells containing the stubs. This means that there are empty cells in all other columns of the caption row. When "span cells" is checked, the empty cells in the caption row are removed and the caption is placed in one large cell that spans the entire row. This allows you, for example, to center or right justify the caption in the entire row (by setting the alignment). Decimal Places: Sets the number of decimal places used to display numeric values for the selected element. If applied to a data cell, this sets the number of decimal places used for that individual cell. If applied to a column head or stub it sets the number of decimal places for the entire row or column. This may only be applied to data cells, column heads and stubs.